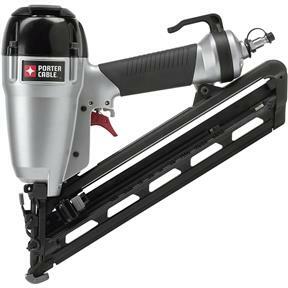 The Porter-Cable DA250C 1-to-2-1/2-inch 15-gauge Angled Finish Nailer comes with a maintenance-free motor for added reliability and longer tool life. Featuring a long life maintenance/oil-free motor that prevents oil from staining the work surface, an internal piston catch for consistent max power on every shot, and a rear exhaust that keep contaminates away from work, the DA250C is part of the newest generation of Porter Cable finish nailers. With the ability to drive 15 gauge nails from 1" to 2 1/2" in length, a tool-free depth-of-drive adjustment with detents for proper setting of nail heads, tool-free jam release mechanism for easy nail removal, a sequential style trigger with lock off switch and a removable non-marring nose tip with on tool storage, the DA250C meets all of the requirements that the discerning end user demands.